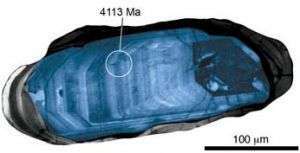 Zircons, the oldest known materials on Earth, offer a window in time back as far as 4.4 billion years ago, when the planet was a mere 150 million years old. Because these crystals are exceptionally resistant to chemical changes, they have become the gold standard for determining the age of ancient rocks, says UW-Madison geologist John Valley. Valley previously used these tiny mineral grains — smaller than a speck of sand — to show that rocky continents and liquid water formed on the Earth much earlier than previously thought, about 4.2 billion years ago. Previous explanations for the missing rocks have included destruction by barrages of meteorites and the possibility that the early Earth was a red-hot sea of magma in which rocks could not form. "At 4.3 billion years ago, the Earth already had habitable conditions," Ushikubo says. Carbon dioxide in the atmosphere can combine with water to form carbonic acid, which falls as acid rain. The early Earth's atmosphere is believed to have contained extremely high levels of carbon dioxide — maybe 10,000 times as much as today. "At [those levels], you would have had vicious acid rain and intense greenhouse [effects]. That is a condition that will dissolve rocks," Valley says. "If granites were on the surface of the Earth, they would have been destroyed almost immediately — geologically speaking — and the only remnants that we could recognize as ancient would be these zircons."